Well, I'm sure Will was not referring to insomnia when he penned those famous lines from Hamlet. But it's also a sure bet that at some point he, too, suffered from this common contemporary malady. Millions of people suffer from the inability to get a good nights sleep. Sleep can be likened to a "bank" and after awhile you find that your bank account is severely overdrawn. 1. The importance of a physical checkup with your doctor. 2. How to understand exactly what is causing the sleeplessness. Sounds easy doesn't it? It can be simple. 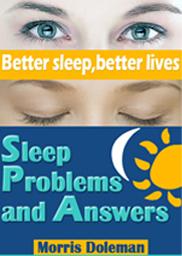 Once you get past all the unimportant stuff, "Sleep Problems and Answers" shows you everything you need to know to deal with your personal situation. •	You don’t need any special education. •	It's a simple and easy read for anyone. •	It doesn’t require much time to implement the suggestions. •	You can start preparing as soon as you’ve read the guide. •	And, it’s a real bargain!